Junior Political Officer Alexei Eremenko raises soldiers to attack. This is a very well-known photo of the Great Patriotic War. Alexei Eremenko died after a few seconds after the photo was taken. Picture named “Combat” (ie, “the commander of the battalion”), the author mistakenly photos. Max Alpert managed to make a couple of shots of the battalion commander, who had raised the soldiers in the attack, and then a shell splinter smashed the camera. Photographer decided that spoiled shots, and did not write a person’s name, which he photographed. Later, showing the film, he saw the picture turned out excellent. M. Alpert remembered as heard in that battle that passed through the ranks, “the battalion commander was killed,” and decided that he photographed was the battalion commander. 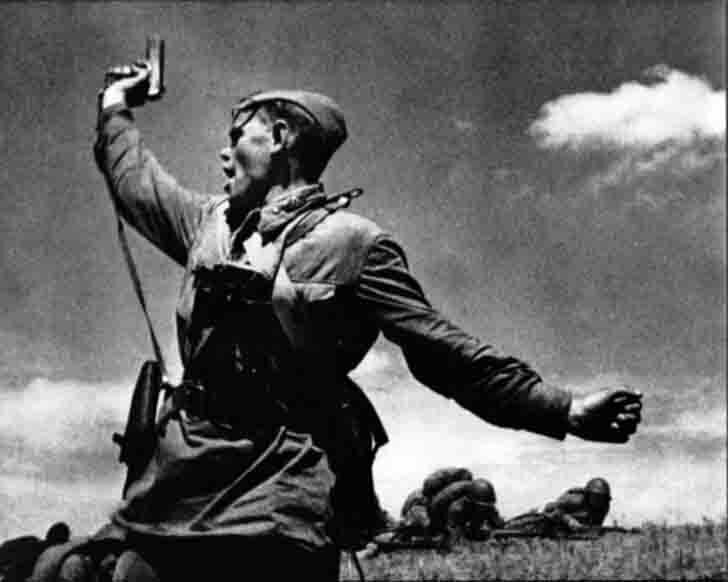 Only after the picture has received world fame under the name of “Combat”, it was the identity of the hero in the picture: Alexei Eremenko, 1906 birth. The photo was taken July 12, 1942 about Khoroshee village (now the village of Good, Slavyanoserbsk district, Luhansk region) between the rivers Lugan and Lozova, on the site where he kept the defense of the 220th Infantry Regiment of the 4th Infantry Division, leading the persistent bloody defensive battles against the superior enemy forces.